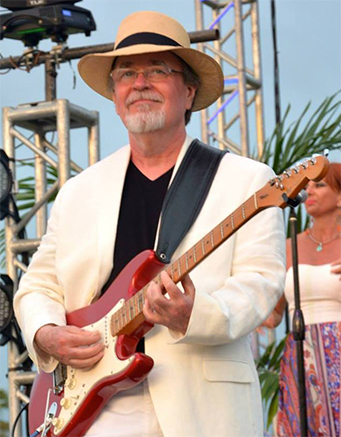 Roger is the original guitarist of Jimmy Buffett's Coral Reefer band. In the early days it was just Jimmy and Roger. Two acoustic guitars, and vocals. After a year on the road as a duo, and with the success of a hit song, Come Monday, it was clear a band was needed for the bigger venues they were playing, so Jimmy added Greg "Fingers" Taylor on harmonica and keyboard, Harry Dailey on bass and Phillip Fajardo on drums. Roger is also infamous as the singer and writer of the song Fool for a Blonde from the classic horror movie "The Texas Chainsaw Massacre," and for the many incarnations of his own bands, and as lead guitarist for many artists from New York to Las Vegas. Roger was born in Shreveport, Louisiana. His father, Ray Bartlett, announcer for the nationally-syndicated radio show, The Louisiana Hayride, announced his birth to the coast-to-coast radio audience setting off a chain of events that continues today. His dad, besides sharing the Hayride stage with such legends as Hank Williams, Elvis Presley, Roy Orbison, Johnny Horton and others, hosted his own show, Groovey's Boogie... with Groovey Boy, featuring the records of rhythm and blues and jazz artists like Muddy Waters, Johnny Otis, Duke Ellington and Cab Calloway. These were the musical influences that rocked Roger to sleep at night and played throughout the day. Roger leads his band delivering contemporary blues-based music that has elements of rock and funk with a little jazzy thing thrown in. With his distinctive voice, lead guitar work and twisted sense of humor, his music is unique. As a composer, Roger is working on a musical titled, Things've Gotta Change, inspired by his father's career as a radio personality. Set in 1953, in Shreveport, LA, it chronicals a time of great change in the music business, societal norms and rapid technological advances. Roger is also working with Phyllis MacBryde on a jazz-based musical called Zinzi. It's the story of a girl with almost supernatural artistic talent from South Africa who emigrates to the creative cauldron of BeBop Harlem in the post-war era in search of a family, an education and a dream. Roger has shared the stage with many artists. Some of the most notable are: The Eagles, James Taylor, Lightnin' Hopkins, Jackie Wilson, Hoyt Axton, Heart, The Nitty Gritty Dirt Band, The Doobie Brothers, Jerry Jeff Walker, Doc Watson, Steve Goodman, Charlie Daniels Band, Count Basie, Three Dog Night, Tom Rush, Pablo Cruise, John Hartford, Ramblin' Jack Elliot, the Drifters, Little Feat, and many, many more. Roger lives and works out of New York City, playing with his band, as a sideman and as a composer and writer for albums, Theater, TV and film.